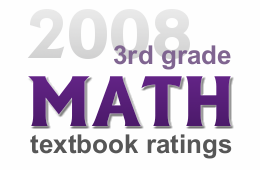 Texas approved seven of these 3rd grade Math programs for 2008 local adoption. This ranking shows how much those programs practice addition and subtraction with regrouping, how well they teach multiplication and division number facts, and how strongly they stress standard multiplication and division algorithms. It is relevant to other elementary grades also, since each series will repeat there the pedagogy we identify in grade 3. Besides our summary comparison chart, we can send you 7 more pages of free documentation. Publishers tout teaching aides. We stress subject matter content. Publishers tell you their strengths. We include their weaknesses. No textbook publisher funds us in any way. We have no financial stake in the textbook industry. Unlike publisher sales reps, we have no monetary interest in any adoption outcome. Our support comes from individuals and a few small foundations, which to our knowledge have no ties to any textbook company. For full, fast, FREE documentation, submit the online request form OR email us!